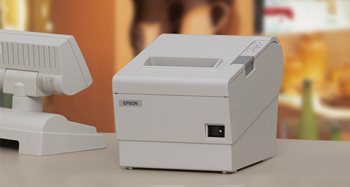 Using Epson POS printers, you avoid problems at the point of sale and upsetting your customers. No other manufacturer has a similar in-depth understanding of receipt printers, no other has a worldwide market share nearly as large. Jarltech is a long-standing official Epson partner and today is the largest distributor in German-speaking Europe. We have 2,000 POS printers of the most diverse kinds ready from stock. Even rare printer and connection types will be delivered to you the next day. It goes without saying that you receive from us original spare parts and suitable accessories, as well as consumables, e.g. receipt rolls, colour ribbons, or cables recommended by Epson. Our size is your purchasing advantage, because due to our huge purchasing quantities, we are always able to offer Epson POS printers at the best prices, no matter whether you order only one, a hundred, or a thousand units. Besides that, Epson offers you a uniquely vast selection: the range of supplied POS printers stretches from printers designed for simple applications all the way to high performance equipment for the wholesale trade, such as two-colour thermal POS printers or mobile special printers. Our portfolio contains devices for the »classical« stationary sales areas as well as for the modern mobile point of sale. Epson offers you the peace of mind of a prestigious big enterprise: there is a reason that statistically, every second receipt printed in the world is printed on an Epson printer. The technical competence of the Japanese manufacturer, paired with uncompromising reliability, is reflected in every single detail of the POS printers. This fact is confirmed by impressively low failure rates during long-term laboratory testing, as well as by many years of practical, real-life experience. By the way: The newest generation of printers has multiple interfaces and thus represents a future-proof investment. In addition, the majority of the devices may be adapted to future needs by exchanging interfaces, which once again increases the investment security for you and your customers.